The mining industry should conserve and utilize low grade chrome ore through beneficiation and pelletization. Export of ferrochrome should be encouraged and not chrome ore. Occupational health hazard from chromium mining is an area that needs much attention. Chrome ore is used to produce ferroalloys for making stainless steels. Low grade chrome ore (<40% Cr2O3) needs to be conserved and utilized for beneficiation. 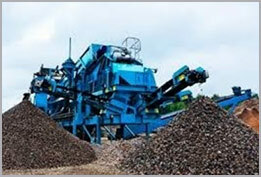 The companies should utilize concentrates and naturally occurring sandy chrome ore through pelletization. Small mines should use ore concentrators for utilization of low grade ore. Custom milling machines and concentrators are useful for small units, and should be provided by the government. mineral, E&P activities should be intensified to find new reserves for chrome ore. The industry should reduce export of chrome ore; preservation of this mineral is necessary for use in domestic steel production. Instead of chrome ore, ferrochrome can be exported. The quality of ferrochrome should be increased to gain international acceptance. There are scores of small, poorly managed mines exploiting chrome ore without spending enough for community and infrastructure development around the mines. Further, it is necessary to integrate small deposits to form big mine with considerable reserve to become economically viable. Mines should be mechanised to augment output. Finally, pollution due to waste, and occupational health hazard due to chromite mining are the areas that need serious attention.